We’d love your help. Let us know what’s wrong with this preview of A Cottonwood Stand by Chuck Redman. To ask other readers questions about A Cottonwood Stand, please sign up. Hi, Chuck! Brenda told me about this book. How did you get the idea to write it? Chuck Redman Hi, Nancy. How terrific to hear from you. I was just in Nebraska for a few days, for book events at the State Fair and Book Festival. I've become a…moreHi, Nancy. How terrific to hear from you. I was just in Nebraska for a few days, for book events at the State Fair and Book Festival. I've become a tree lover, and I always thought the cottonwood was the prettiest. I wanted to write about how much we have lost already by destroying our Native American culture, and how much we seem to be losing by letting our small towns and environment be spoiled by big agribusiness and other changes. Thanks so much for your beautiful review of the book. That means so much to me. I hope we can get in touch further and catch up on all the years that have flown by. Two stories intertwined, past and present, author Chuck Redman takes us on an adventure set in Nebraska. From the very beginning, as we learn how the cottonwood trees came to be, to now when their existences is being threatened, the story is narrated by a man who is from the little Nebraska town of Cottonwood. His colloquial, Nebraskan slang takes some getting used to, but once you get the rhythm down, you can immerse yourself in the details of the story and it's almost as if you're right there and he's telling you first hand the all these little asides. Lark, A Native American girl from the Sioux nation travels across the plains in hopes of finding her adopted sister's family and stop an arranged marriage. Facing deadly obstacles along the way, Lark finds herself in the hands of the Pawnee who are more interested in Lark, and what she could mean for them, than her sister. As her agenda changes and she falls in love, she unknowingly plants a seed that will carry on for hundreds of years. In the present, Janet is the editor of the local newspaper and is determined to get the real scoop when a meatpacking plant/slaughter house tries to move into their fair little town and wants to cut down their historical cottonwoods. I'll be honest, I had a little bit of a hard time following along with the story at first. Some of it may have been the language and some of it may have been the writing style. I felt like I could have been a little kid sitting in the grass as the old narrator told us the story of this old Nebraska town, jumping from this person to that person trying to really bring us into the story. But the amount of details really helped add to the story and give a broader perspective of what the cottonwoods really mean to the town, and once I got used to the writing style, it was quite enjoyable. I actually enjoyed the story line of Lark the best. The knowledge the author showed of the Native Americans and their rituals was interesting and really brought that story to life for me. I don't believe this book is for everyone, but it would be a great read for anyone who enjoys intertwining past and present, or has an interest in Nebraskan history. It is an interesting read, even if reading just for fun. Be prepared for the colloquial language and the fact that the author flows from one story to the other without any type of chapter or page break. Happy Reading. Chuck Redman provides a brilliant juxtaposition of Nebraska past and present in this entertaining and educational tour de force. There are two stories here. In one, a young Native American (Oglala Sioux) woman named “Lark Laying Eggs” (from an epoch well before industrialization and gentrification) goes on a daring adventure involving travel and another tribe to prevent an arranged marriage. She is determined and passionate in her cause. As is one of her modern day counterparts in the parallel s Chuck Redman provides a brilliant juxtaposition of Nebraska past and present in this entertaining and educational tour de force. As is one of her modern day counterparts in the parallel story. Janet Hinderson, the editor of the local newspaper The Cottonwood Caterwauler, is outraged at the prospect of her town’s beloved and majestic cottonwoods being cut down to allow for a slaughterhouse (or meatpacking plant depending on one’s point of view ) to set up operations in the small idyllic town of Cottonwood. However, Janet becomes a bit conflicted when she unexpectedly finds herself taking a liking to the general counsel for the meatpacking company. One can appreciate the author’s extensive research by the detail in which Native American culture is depicted. The prose is particularly impressive in the descriptions of pre-developed Nebraska. "The sun is sank low in the peaked sky. Fingers of it poke through young leaves and old branches to the floor. Not every Pawnee shaves the sides of his head so fierce, cause this stocky fella with shoulders like a stevadore has his hair growed out long, and loose. Which is good right about now since that fresh doeskin poultice plastered across his puffed and purpled cheekbone ain’t such a wonderful thing to behold. This here’s a small clearing. Sheltered between two tall beauties, a cottonwood on the south and an elm on the north. Imagine what these two trees have seen and shared over the years. Somewhere close by a dove sits still and thoughtful, and rehearses its ageless cradlesong that lullabies me surer than any sound, animal, human or otherwise." There is a lot going on in this short book. There are two juxtaposed stories happening centuries apart centering on defiant, strong women who want to 'right the wrongs'. The narrator is a charming old fellow (I won't identify him but he is the heart of these stories) that captured me along with many of the other charming characters encountered along the way. The dialogue is sharp and catchy. There is humor, pathos, social commentary and innate human nature that make this an enthusiastic recommen There is a lot going on in this short book. There are two juxtaposed stories happening centuries apart centering on defiant, strong women who want to 'right the wrongs'. The narrator is a charming old fellow (I won't identify him but he is the heart of these stories) that captured me along with many of the other charming characters encountered along the way. The dialogue is sharp and catchy. There is humor, pathos, social commentary and innate human nature that make this an enthusiastic recommend. The narrator in A Cottonwood Stand is easy-going, matter-of-fact, and colorful, which means even difficult things come across as, “don’t take it too seriously.” The author uses mild colloquial speech (“that’s the way it’s sittin,” “anyhoo”) which grows comfortable and adds to the charm. There are two stories told nearly simultaneously, which also works, surprisingly. Many characters in the contemporary story are fun and you get to know the small town of Cottonwood. Satire comes in driblets, as i The narrator in A Cottonwood Stand is easy-going, matter-of-fact, and colorful, which means even difficult things come across as, “don’t take it too seriously.” The author uses mild colloquial speech (“that’s the way it’s sittin,” “anyhoo”) which grows comfortable and adds to the charm. There are two stories told nearly simultaneously, which also works, surprisingly. Many characters in the contemporary story are fun and you get to know the small town of Cottonwood. Satire comes in driblets, as if a master story-teller were leaning back with a wink, every paragraph. It’s like watching a rich reality show with amazing detail, except the underlying drama is the town’s threatened total take-over by the meatpacking industry. The story is truly charming and gave me an appreciation of Nebraska I don’t think I could have gotten any other way, anywhere else. I think Redman is a Garrison Keillor of Nebraska. I really wanted to like this book. I have been through Nebraska but have never stopped there. I took the route that follows the Platte River. I took notes because I like to keep the characters and the time lines straight. I did find quirky characters and humor in the story. I just wish that the story had been easier to follow. I did like the arguments against having a meat packing company take over the protected site in the town' s charter. I could add my own personal arguments against it. But it I really wanted to like this book. I have been through Nebraska but have never stopped there. I took the route that follows the Platte River. I took notes because I like to keep the characters and the time lines straight. But it was a struggle to keep things straight when reading this book. 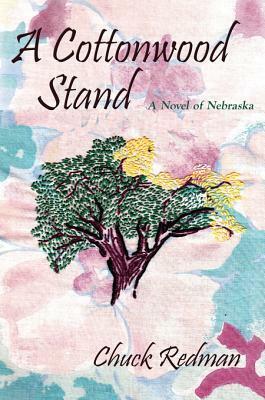 "A Cottonwood Stand: A Novel of Nebraska" is comprised of two interconnecting stories between two young women. The book starts out with the story set in present-day 2010 in Cottonwood, Nebraska. The main character, Janet, along with Tanya, a minor character who has a connection to the past, must work to save the old Cottonwood tree from being torn down and risk losing its historical value. The other storyline also takes place in Nebraska, and is about a young Sioux woman by the name of Lark, who "A Cottonwood Stand: A Novel of Nebraska" is comprised of two interconnecting stories between two young women. The book starts out with the story set in present-day 2010 in Cottonwood, Nebraska. The main character, Janet, along with Tanya, a minor character who has a connection to the past, must work to save the old Cottonwood tree from being torn down and risk losing its historical value. The other storyline also takes place in Nebraska, and is about a young Sioux woman by the name of Lark, who is trying to save her adopted sister, Running Water from an arranged marriage. Lark must also deal with social issues of living among another tribe, with the same Cottonwood tree playing a significant role.